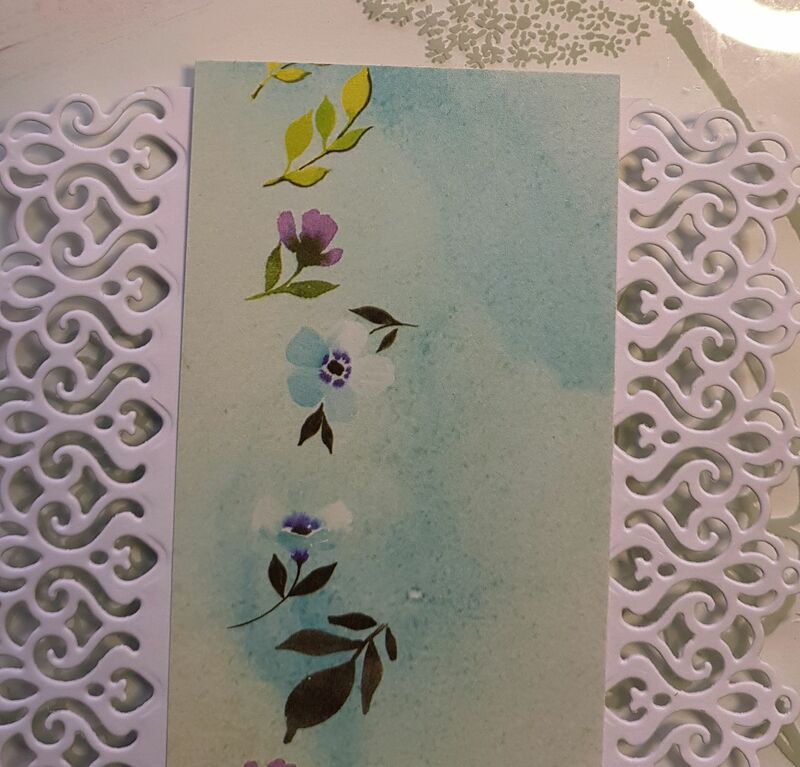 This card is made using papers and dies from Couture Creations - Le Petit Jardin collection. 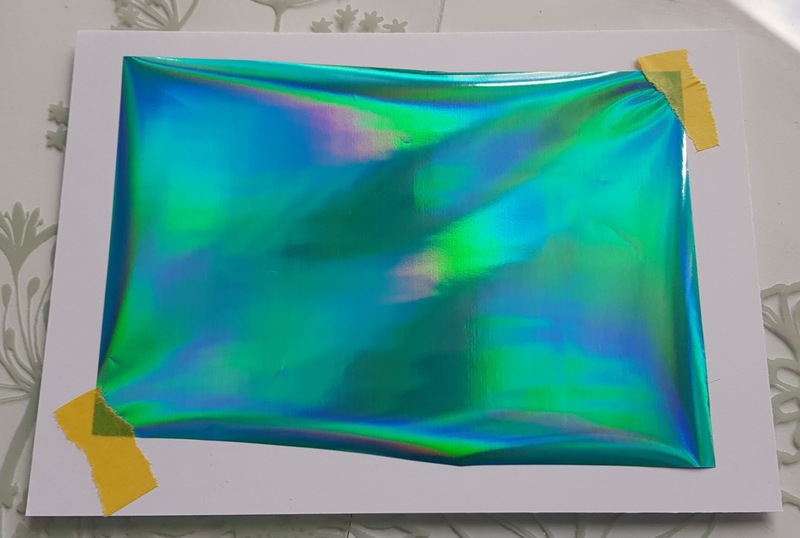 The card size is A5 (21cm x 14.9cm), with the backing paper cut to 20.2cm x 14.1cm, which leaved a border around the edge of the backing paper of 4mm on each side. 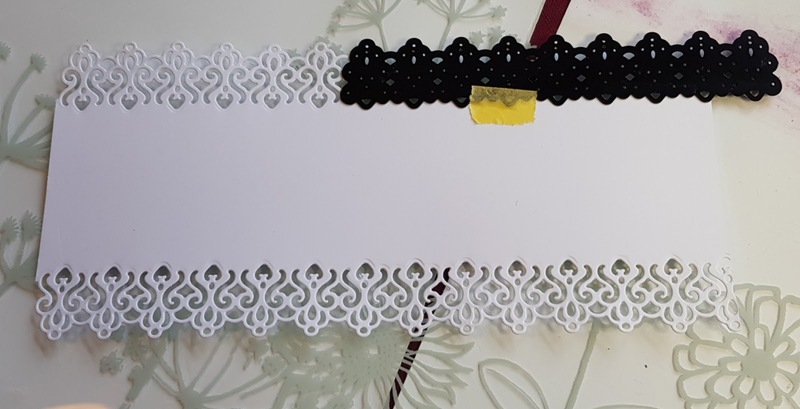 Before sticking down the backing paper, its best to make up the lace panel as it has to be stuck in place and trimmed before the backing paper is stuck down. 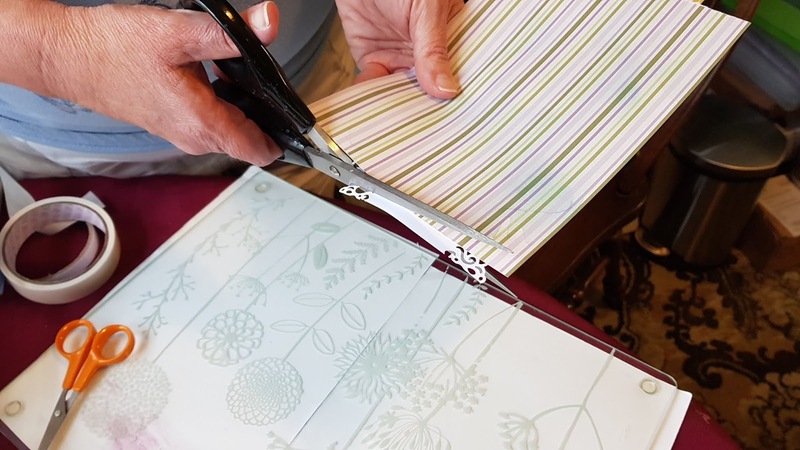 Cut a strip of white card to 10cm wide by 21 cm long. 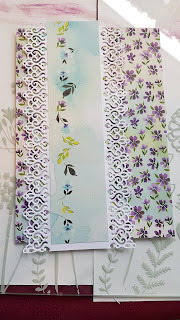 Place the Petit Floral Edge die along one of the long edges, so that one end is lined up with the end of the card strip and the cutting edge is along the long edge. Tape it in place. Position in your cutting plates so that the cut starts where the die is against the end of the card and stops before the other end of the die and run through your machine. Then move the die along, carefully making the end of the previous die cut fit back into the die. Tape it down and position in our plates so that you start cutting from the end where the die overhangs the end of the card and stops before the end of the die that overlaps the card that has already been die cut. There are more details about doing this in the video. 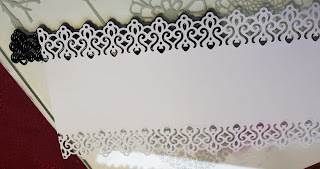 Cut a strip of the patterned paper to 21cm x 5cm, and stick in place on the lace edges panel so that it over hangs the top edge (where you started your die cuts) just a little, so that it can be trimmed with the lace panel to give a perfect edge. 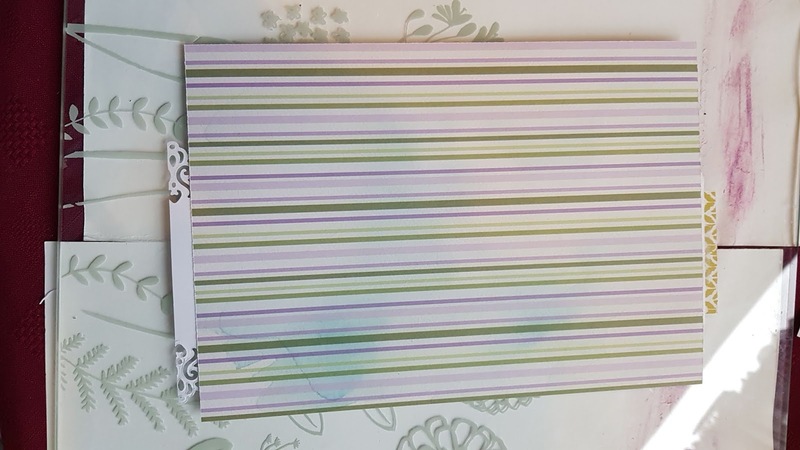 It doesn't matter that the strip of patterned paper doesn't quite reach the bottom of the card panel as it is going to be trimmed - but only after the panel has been stuck in place on the backing paper, as shown below. 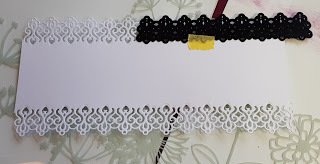 Once the lace panel has been stuck in place on the backing paper, turn over the backing paper and use scissors to trim the ends of the lace panel flush with the backing paper. 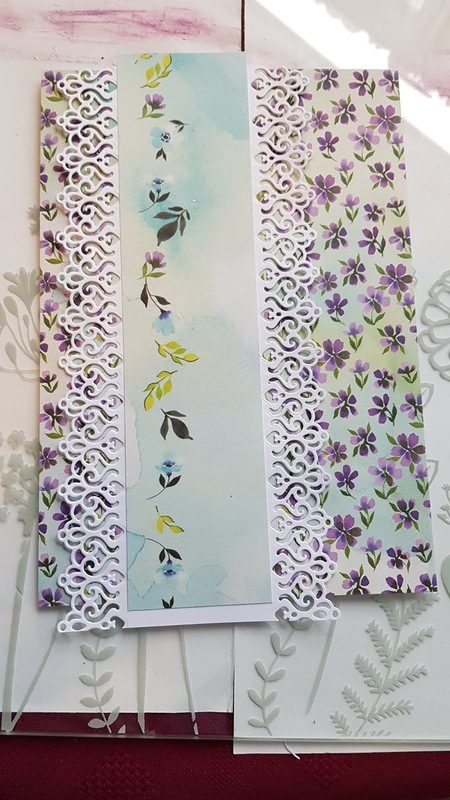 Now you can stick your backing paper, with the lace panel in place on your card blank. 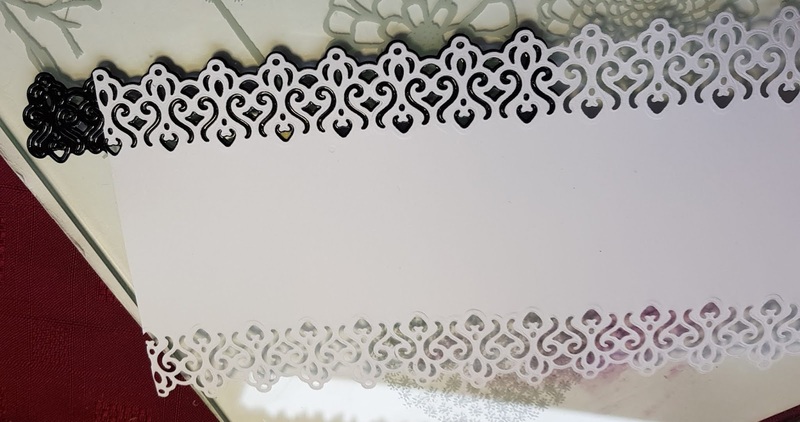 Foil and cut the sentiment topper and mount on foam pads in the center of the lace panel. 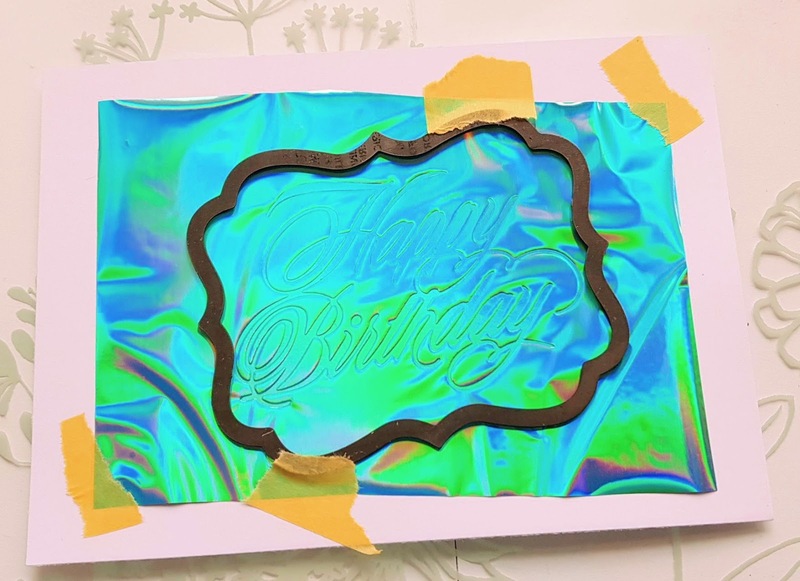 Video 2 shows how to foil the sentiment and frame with one piece of foil, and get the words correctly aligned within the frame. 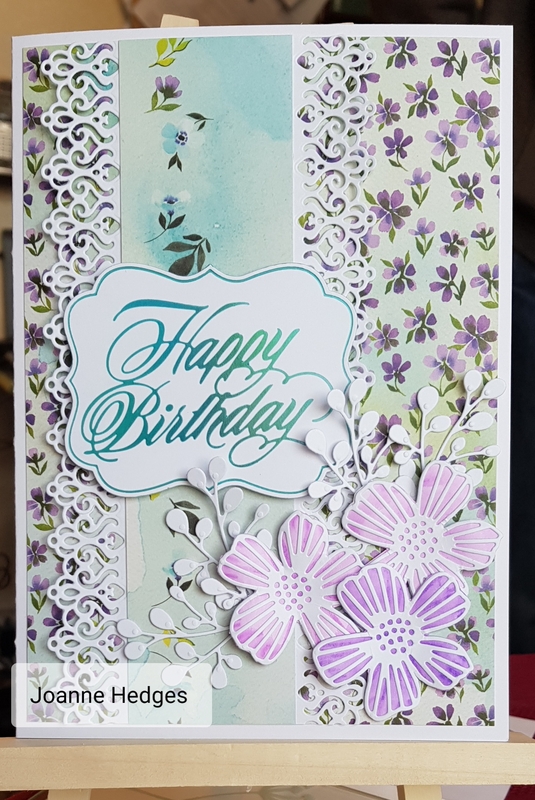 I used the Couture Creations Modern Essentials Cut, Foil and Emboss - Bracket Frames. 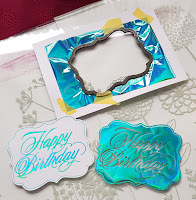 Cut a piece of foil large enough to foil the frame and hold it in place on some white card using some low tack tape. Foil the sentiment first in the center of the foil, and leave the foil in place on the card. 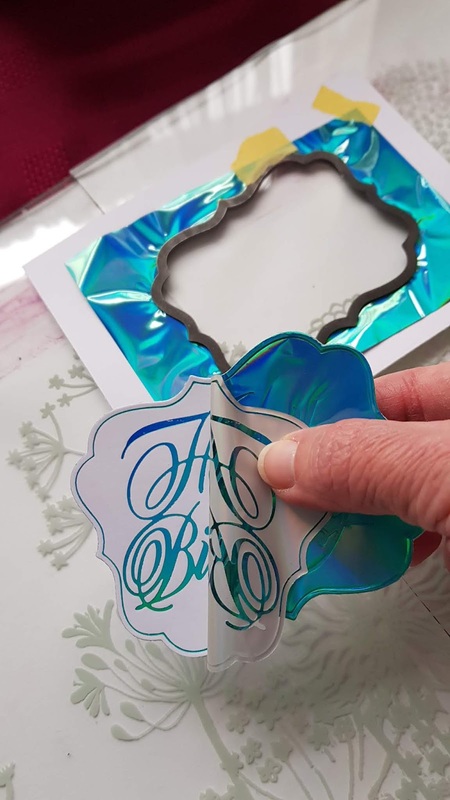 Remove the sentiment hot foil stamp from the GoPress & Foil and put a thin metal shim over the hot plate and allow to heat up. Position the frame Cut, Foil and Emboss die over the sentiment (cutting edge down) and use some more low tack tape to hold it in place. Put the card and die onto the GoPress & Foil (on the metal shim) with the die in contact with the metal shim and card on top. 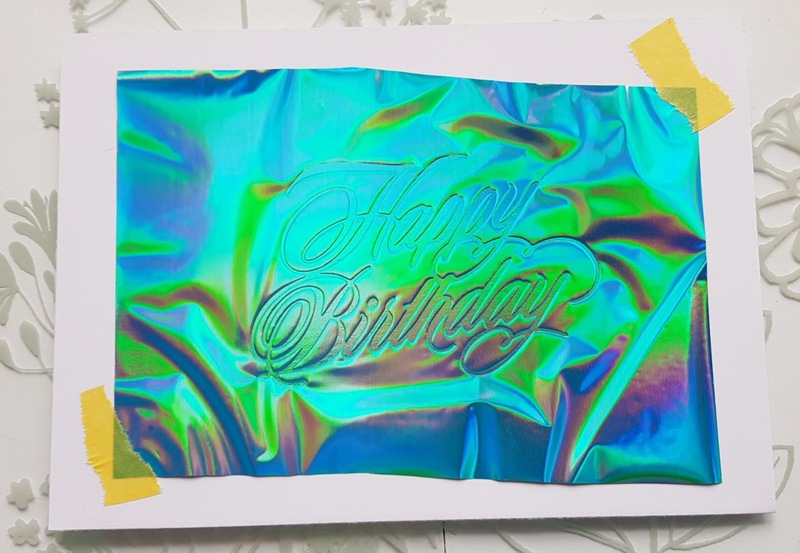 Leave it 30 seconds to heat up, then roll the GoPress & Foil hot plate through your die cutting machine. 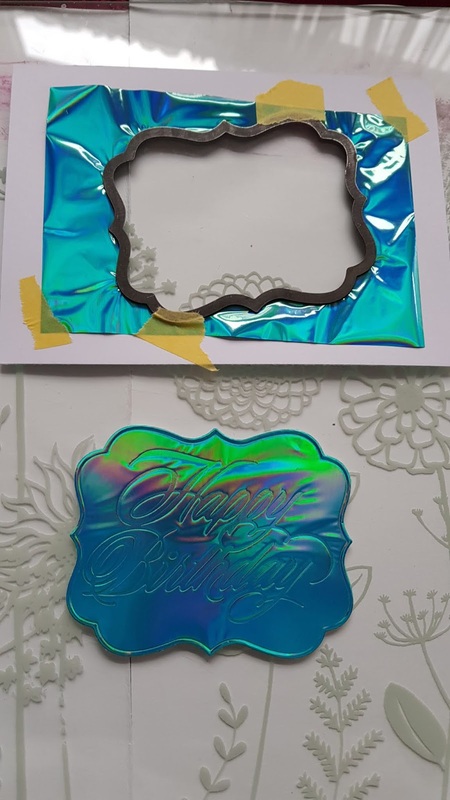 Remove the card and die from the GoPress & Foil using the pick and lift tool - its HOT! 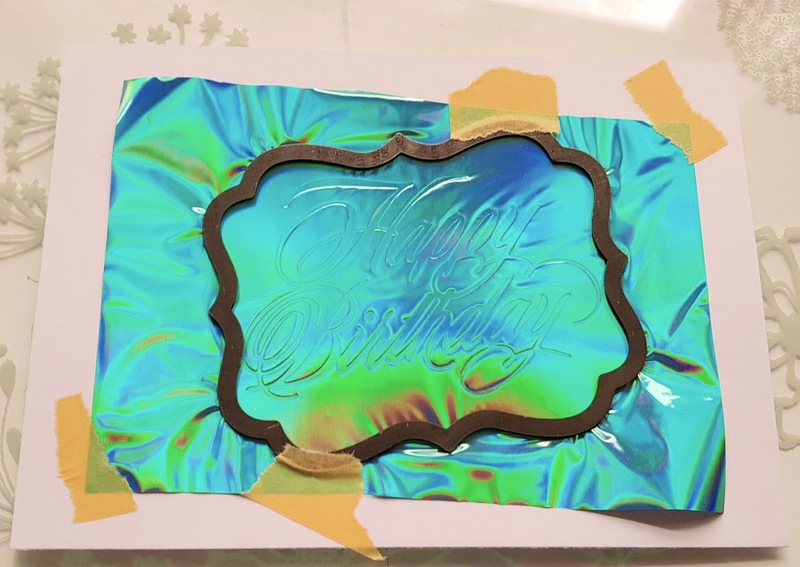 and allow to cool for a few minutes before popping the die cut out of the die and removing the foil. Don't forget to remove the die from your waste card before you tidy up. Die cut 3 flowers using the Morning Daisy mini die, and 4 of the Evening Branch from white card. 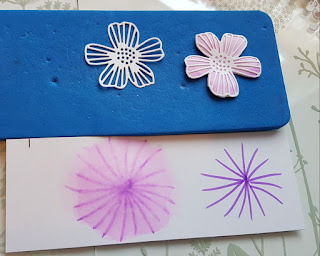 I used some stamping/water color card and water based marker pens to create the backing for my flowers, but you could use pigment stamping inks or Distress Inks applied with a blending tool or sponge, or use colored card instead. 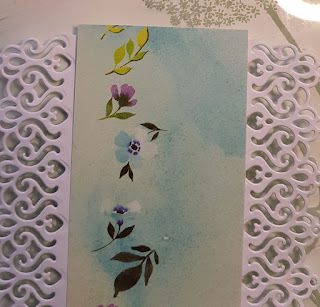 Either scribble on a glass mat with a purple pen and pick up the color with a wet paintbrush or water brush and apply to your stamping card or draw some lines on the card and disperse the ink from the lines using a wet paintbrush or water brush - see how I do this in my video at the end of this post. 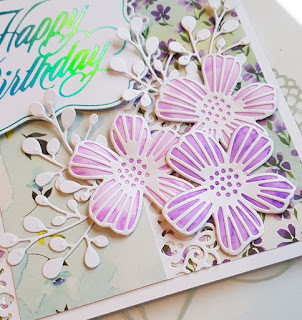 You need to make 3 colored pieces to back your die cut flowers. Stick each flower over a colored area using a wet craft glue, and cut around the edge of the die cut while the glue is still wet, then shape your flower from the back on a piece of foam using a large ball tool. When you've shaped the petals, turn the flower over and use the ball tool to press down in the center of the flower. 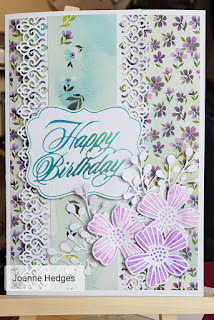 Arrange the flowers and Evening Branch die cuts in the bottom right corner of the card.